Crispy Baby Corn Chili,is a very delicious,spicy and easy recipe - works perfect as appetizer and great for potlucks if you are out of ideas! 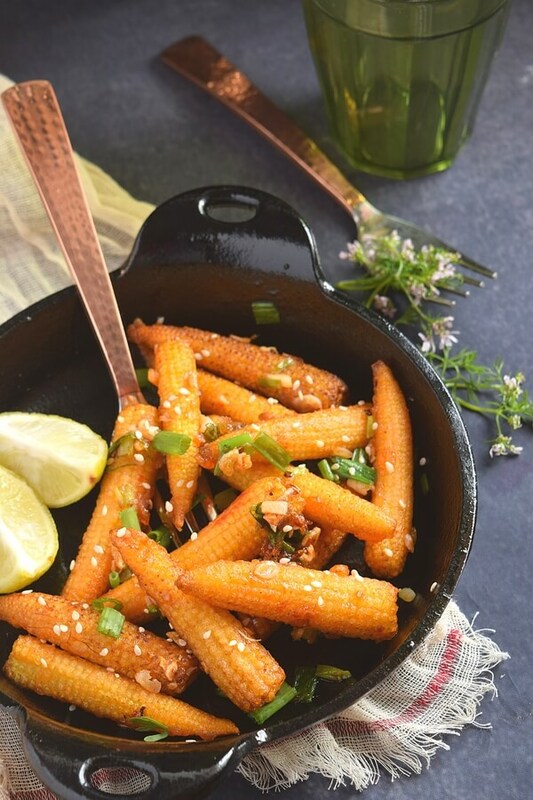 A new makeover for my famous post for vegetarian lovers....Crispy Baby Corn Chili ! 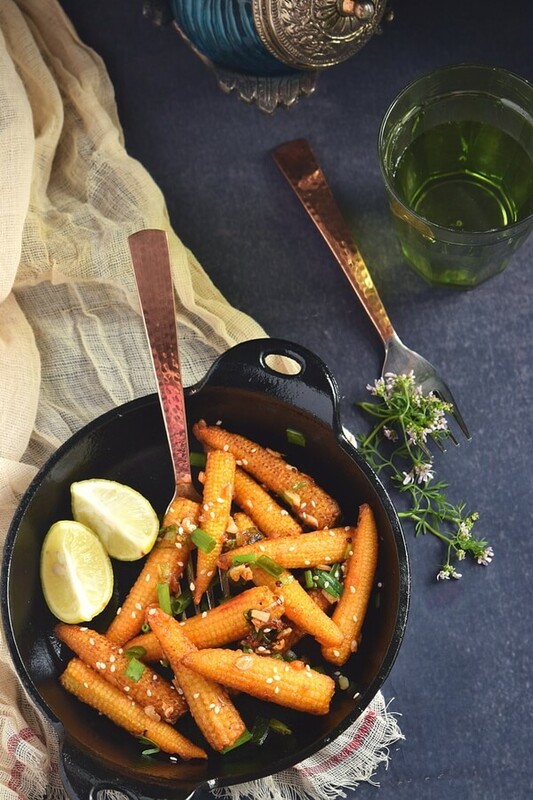 Well,to be frank,I had hardly tasted Baby Corn,until recently at a party when I tasted a nice crunchy version of it,I was really taken aback and wanted to try more recipes with it. 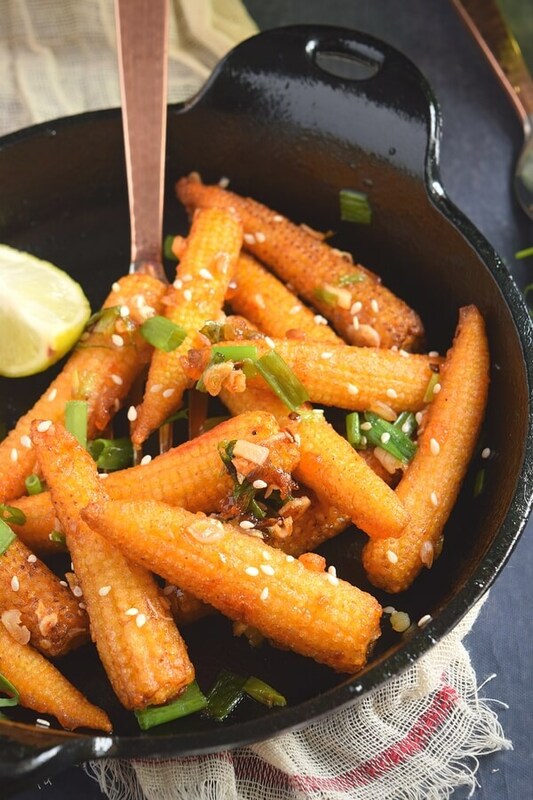 This version of crispy Baby Corn is best,when prepared freshly and served instantly...trust me you will finish it in no time. 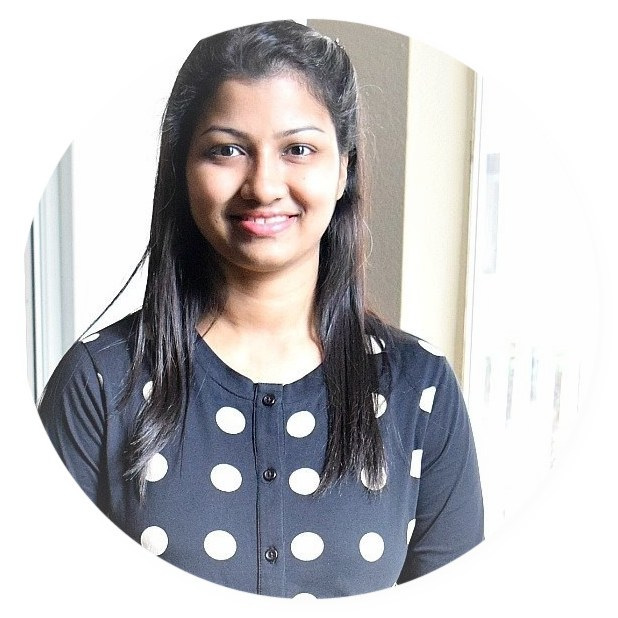 This recipe is very easy and very tasty, I did a deep fry version,you can fry in air fryer to make the recipe healthy.Try shallow fry too or even bake them and see. This would be great fit for parties as appetizer / starters and even as finger food for potlucks. I regularly get Baby Corn these days and somehow so love it that these Baby Corn spicy and crispy Chili is a regular. I also make pizza,sandwich,roll with these! The way have presented this makes one feel that this is gravy or something to be eaten with rice or bread,but no,serve each baby corn with a toothpick inserted to make it finger food or just serve few baby corn chili to make them appetizers, these wonderful either ways. I have many appetizers / starter recipes shared on my website. 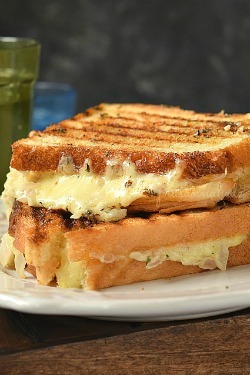 Check out this for more options Appetizers and Under30minsRecipes. If you liked my post and want to try it then save it for later! Spicy delicious and crispy Baby Corn Chili tossed is a wonderful recipe that makes spicy appetizer for potlucks. Firstly,wash the Baby Corn and dry them with a kitchen towel. Cut each Baby Corn into half or use it as it is as per choice. Now in a mixing bowl,add all the ingredients mentioned under marination,except oil and water. Add water little by little to form a smooth paste. The paste should neither be too thick nor too thin or watery. In a deep frying pan,heat oil. When the oil is hot enough,bring the flame to medium. Coat all the Baby Corn pieces with the batter. Now slowly drop each piece in the hot oil and deep fry them till they are crispy and fried well. In a heavy bottom pan,add oil. When the oil gets hot,add garlic,green chilies,cilantro. Fry them for a while. Now add the spring onion whites and toss them for while on high flame. Now reduce the flame and add salt,pepper powder,chilli sauce,garlic sauce. Bring the flame back to high and add fried Baby Corn. Toss them on high flame so that they get coated well with the sauce mixture. Now switch off the flame and garnish it with sesame seeds and spring onion greens. Goes very well with noodles or fried rice too. 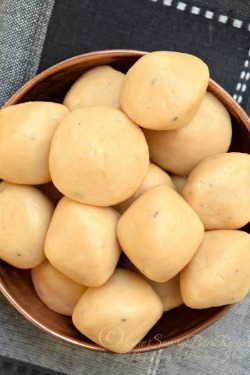 The batter to coat the Baby Corn pieces should be such that it should not be very thick coating nor it should be runny. When fried, the corn pieces should be having a nice coating of batter enough to give you the crisp feeling. I did a deep fry version of this dish. You can use air fryer or bake the pieces too. I will have to try this recipe! looks so delicious! I love babycorn but have never tried it like this. Will definitely have to, it looks so good! THIS looks amazing. It must taste amazing too. Will give it a try. Thanks for this idea. I love baby corn! These sound amazing, bookmarking to try this week - thanks! Now I know what to do with baby corn! I usually just add it to salads, but this sounds much better! Yum! I have actually never prepared baby corn myself. This recipe looks like a great place to start. Love the flavors. I use baby corn, but have never heard of eating it this way. I love how you add all the flavors to the oil so that it penetrates into the corn. I will definitely have to try this. I pinned your recipe, so I will be able to easily find it. These are such little awesome looking corns! You have never tasted baby corn? I can almost not believe it! I LOVE it!!! I love when I find recipes that are totally brand new to me! 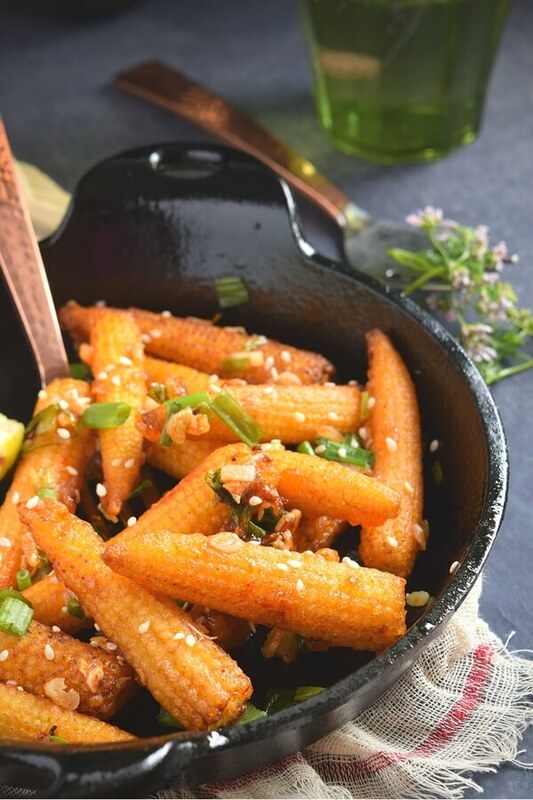 I've never thought to do this with baby corn, but your recipe looks mighty tasty! I've never tasted baby corn, but this looks delicious! baby corn is so underrated. I see it frequently i the market but I have to say I have personally not used it much in my meal plan. I think it; s better known in India then in Europe, we don't use baby corn much in Europe. What a great idea! I usually just toss baby corns into a stir fry. Great idea to feature them in their own recipe! So good! We love baby corn, but never had it on its own as an appetizer. 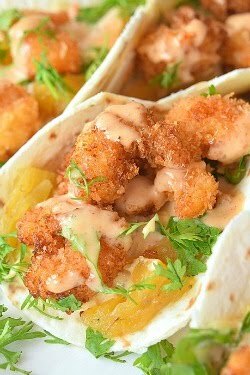 Love the idea of crispy and spicy! These look like fun little appetizers. Maybe perfect for game day, thank for sharing your recipe! 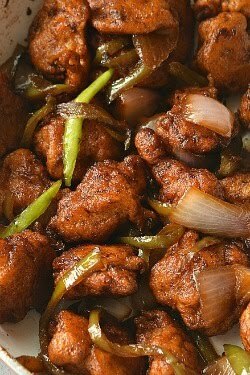 I think this would be a perfect side for General Tso's!